Madigan made… a huge collection of awesomely spooky ideas. This time of year I am always blown away by the DIY/crafty blogging community. So many of the DIY bloggers I know or follow rock the creative ideas when it comes to Halloween. Need a DIY costume idea? Cute and spooky food? Creative pumpkin? Clever Halloween décor? Well, you are in luck! I’ve collected a TON of my favorite spooky ideas from my fav bloggers… and a few ideas from Martha Stewart. (Because, let’s face it, Martha knows how to rock Halloween!) All of these ideas are simple and easy for anyone to make. Kelly’s spider covered table cloth. Melissa’s simple mason jar ghosts. Desiree’s easy Halloween monster treats on a stick. Sibylle’s spooky printable cutlery pouches. Viv’s duct tape houndstooth pumpkin. 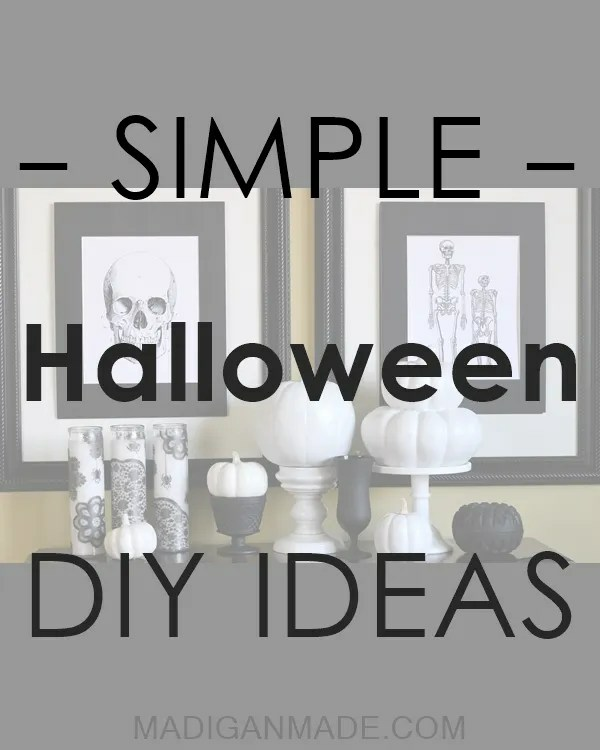 You can find these ideas plus many, many, many more over on my DIY Halloween Pinterest Board. I’ve pinned 100+ ideas and counting! Be sure to follow along all this month as Halloween approaches… I’m sure I’ll be spotting more scary ideas! Have a wonderful (and hopefully crafty!) weekend!